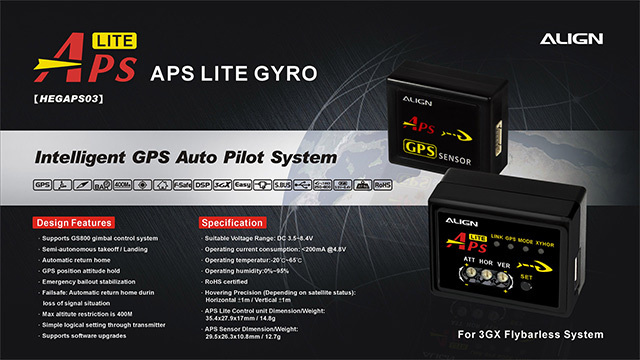 APS Lite Gyro is an electronic flight augmentation device, and can only function when used with Align's 3GX flybarless system. With APS Lite Gyro installed, the helicopter will have the ability to self stabilize, hold position as well as altitude, and even autonomous way point flights as well as return home. It is the perfect tool for flight training, as well as aerial photography applications. 1.Semi-autonomous take off / Landing. 4.Failsafe:Automatic return home during loss of signal situation. 5.Simple logical setting through transmitter. 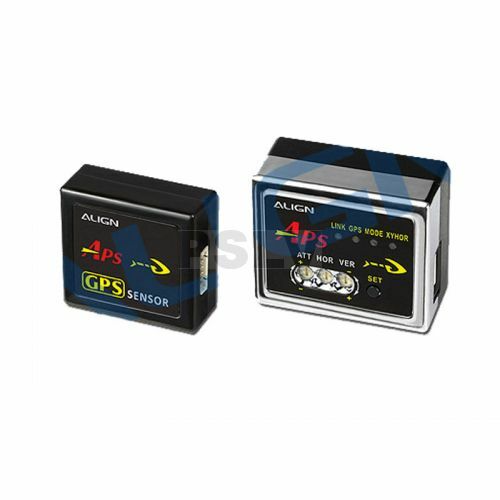 ●Align APS Lite has build in 3-axis accelerometer, 3-axis magnetic compass, altimeter, and GPS sensor to work with DSP processor to enable APS Lite to have precise detection and control abilities. ●For use with Align's 3GX flybarless system for ease of install and simplified setup, APSLite is functional with a few setup steps. 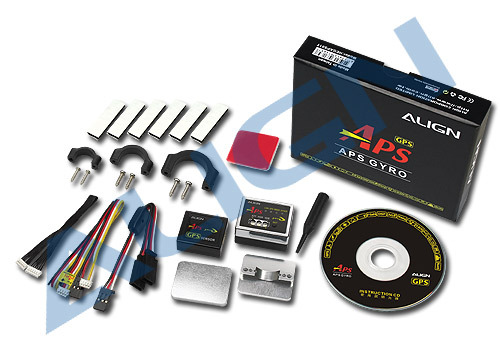 ●Failsafe function, When helicopter lose RC signal, APS Lite will take over and fly the helicopter back to where the helicopter regains RC signal. ●Automatically helicopter stabilize function. When helicopter's attitude is not stable, switch to APS Mode will enable APS to immediately stabilize helicopter and provide a big help for the beginners. ●Supports Spektrum/JR satellite receivers and Futaba S.BUS architecture.